10 travel grants of EUR 300.- travel expenses and free registration (will be reimbursed), will be given based on the quality of the submitted abstract. After finalizing the congress registration, please register for abstract submission <here>. Loged-in in the abstract submission tool, you will be able to submit your travel grant documents, which are one page CV and a publication list of only peer-reviewed articles, until 4 December 2018. The winners will be notified by the organizers around mid of January. 10 travel grants (max. contribution per grant is CHF 700.-) for SSAI members will be given based on the quality of the submitted abstract. After finalizing the congress registration, please register for abstract submission <here>. Loged-in in the abstractsubmission tool you will be able to submit your travel grant documents, which are your SSAI member number*, one page CV and a publication list of only peer-reviewed articles, until 4 December 2018. The winners will be notified by the organizers around mid of January. *should you want to apply for a SSAI travel grant, but are not a member yet, we kindly ask you to fill out the SSAI membership application form. 10 travel grants (max. contribution per grant is EUR 500.-) will be given based on the quality of the submitted abstract. After finalizing the registration, please register for abstract submission <here>. Loged-in in the abstract submission tool you will be able to submit your travel grant documents, which are one page CV and a publication list of only peer-reviewed articles, until 4 December 2018. The winners will be notified by the organizers around mid of January. "BioLegend Best Workshop Presentation Awards" will be distributed to one best presenter of each workshop. The winners of the cash awards (12x EUR 330.-) will be selected by the chairs right after each workshop and honored at the award ceremony the day after. To encourage the interaction between participants and exhibitors there will be a lottery. Stamps will be given to each exhibitor, which will be collected by the participants. 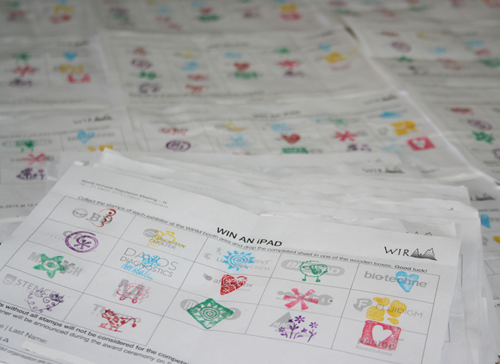 There will be a lottery between the participants who collected all stamps. The prize will be an iPad and will be awarded at the award ceremony of the last day. The iPad went to Margarida Cortez from the Lisbon Medical School in Portugal. Congratulations!